Hello again. Barbara here with another special post today. 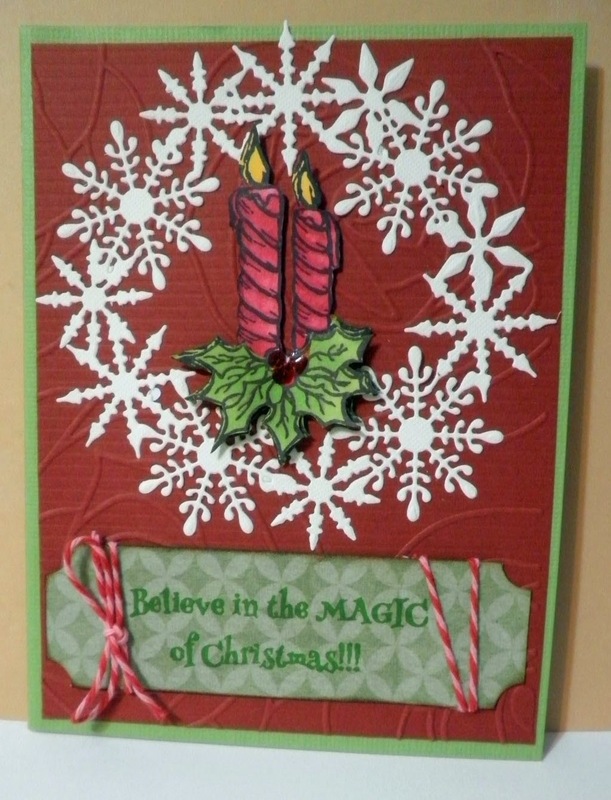 I am still having a ton of fun using Pam Brays Christmas Collection rubber stamps. As the holidays draw closer, I am making cards that are much quicker to make, but look great! This is a regular A2 size green card. I embossed a slightly smaller piece of red card stock with a roses embossing folder and adhered as my second layer. Then I die cut the snowflakes from white card stock and adhered. Now for the fun! I stamped the candles twice onto white card with Memento black ink. Then I colored with Copic markers and cut out one completely, and the second one I cut out only the holly leaves. I used pop dots to raise the candles above the snowflakes. I stamped the sentiment onto a scrap of green print card with green StazOn ink and cut into a ticket shape, wrapping a bit of baker's twine around it. This was adhered directly to the card. And here is a bit of a close up of the dimension I got by using pop dots on the candle centerpiece. I also added a few drops of red Pico Embellisher to the berries. 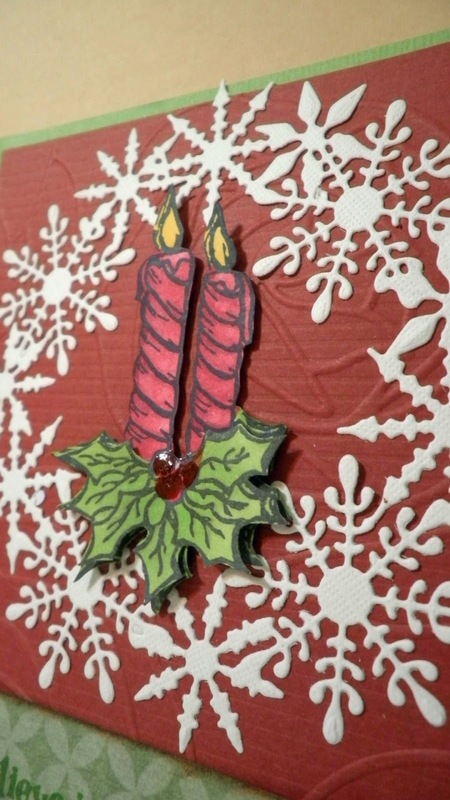 And there you have it, a really quick and easy card that you can make multiples of in a jiffy. I hope you enjoyed this fun and super quick Christmas card. Check back for more inspiration from the rest of the team, and thanks for stopping by. Have a wonderful, creative week! I love this card.. Pam's stamps are awesome the card is wonderful..